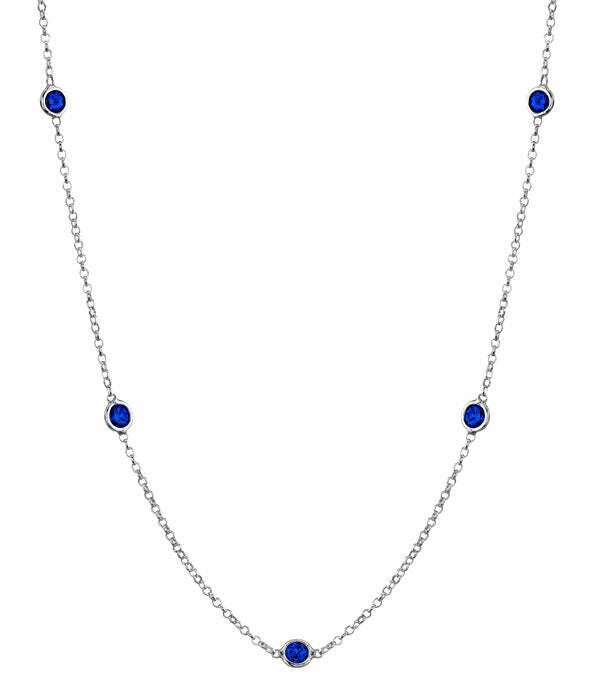 A sapphires station necklace is perfect for adding a burst of fun color to any outfit. At deBebians, we pride ourselves in constantly updating classic and timeless jewelry pieces with a more modern point of view. One of our favorite pieces of jewelry is the diamond bezel necklace. Our jewelry experts wanted to update the bezel station necklace in a fun, yet sophisticated way. The answer is our new collection of sapphire station necklaces necklaces. Our sapphires by the gemstone jewelry features your favorite blue birthstones on their own or birthstones and white diamonds. These necklaces are perfect for adding a pop or color to any outfit or jewelry collection. These items can be customized with various carat weights, number of gemstones, and even by metal type. Which members of your family would most like to receive a sapphires bezel necklace? Perhaps your mother or daughter that has a September birthday, or your wife on Valentine’s Day. The occasions to give this gorgeous necklace are endless.